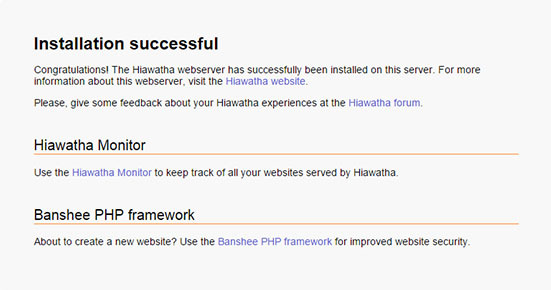 In this tutorial we will show you how to install and configuration of Hiawatha web server on your Ubuntu 16.04 server. For those of you who didn’t know, Hiawatha is a web server built with the focus on security. It has built-in rules that can prevent cross-site scripting and forgery, SQL injections, and resource expenditure. Although its focus is on security, it also excels in performance due to its lightweight design. When combining the Hiawatha web server with PHP-FPM and MySQL, you can have a powerful web server that is both light-weight and secure. This article assumes you have at least basic knowledge of linux, know how to use the shell, and most importantly, you host your site on your own VPS. The installation is quite simple and assumes you are running in the root account, if not you may need to add ‘sudo’ to the commands to get root privileges. I will show you through the step by step installation Hiawatha on a Ubuntu 16.04 (Xenial Xerus) server. Step 2. Installing Hiawatha Web Server. Congratulation’s! You have successfully installed Hiawatha. Thanks for using this tutorial for installing Hiawatha web server in Ubuntu 16.04 (Xenial Xerus) LTS systems. For additional help or useful information, we recommend you to check the official Hiawatha web site. Related Posts of "How To Install Hiawatha Web Server on Ubuntu 16.04"